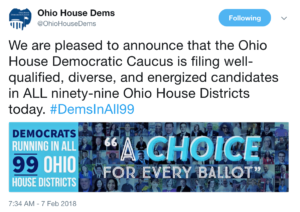 The Ohio Democratic House Caucus announced on Feb.7 that all of Ohio’s 99 house districts will feature Democratic candidates. The candidates running for these seats were announced through the Caucus’s Twitter and are running on every issue one can think of. Each comes with their own realm of experience and knowledge, too. These candidates span from Aden Baker, an 18-year-old in Paulding County running in a R +10 district, to Rachel Crooks, a university administrator who has accused President Trump of sexual misconduct. Not only are the backgrounds of these candidates diverse, but so is their experience. At least 29 of the candidates are young democrats, meaning they are under the age of 36. Ohio Young Democrats named them in a Facebook post on Feb. 7. Many of the candidates have also identified themselves as first-time candidates, choosing 2018 as the year they stand up for change. Of the 99 districts, only 21 will have Democratic primaries on May 8. The other 78 districts will soar through the primary and can begin directly preparing for the battle that will come in the general election on November 6. The Blue Wave that Democrats have seen in Virginia, Alabama and most recently in Missouri is now making its way to Ohio. This impressive move by the Ohio Democratic House Caucus shows that we’re ready to bring on the wave.